So, the Summer Holidays are upon us. The long warm days stretch ahead of us and the kids will be running riot. On our last holiday, we decided to take some books, pens & notebad, a pack of cards and nothing else. Our kids are 6yrs and 4yrs old. We brought no toys. We decided that we wouldn’t need any. And we didn’t. 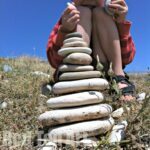 We had a great time together and we also had a great time exploring nature – seeing what nature items where in our local area and making up games and activities for what we could do with these “nature items”. 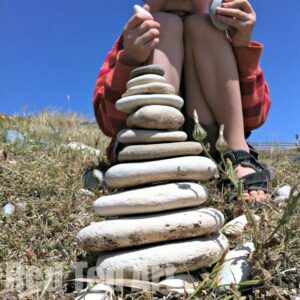 Many of these nature play ideas can be “built” on once home and when you can add a dab of paint or a piece of string or glue. 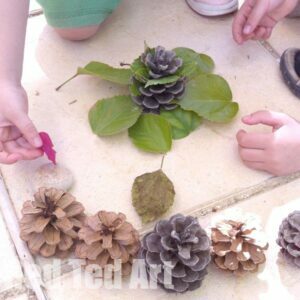 But, all of these ideas work “just as they are”, nothing but nature needed for lots of different play ideas. We took all the photos on my smartphone whilst on holiday. So really, these were “on the go” activities. 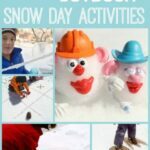 I would say that the majority of the activities work well for 2yrs – 7yrs olds. There are a few for older kids too, but I would love to hear your thoughts! 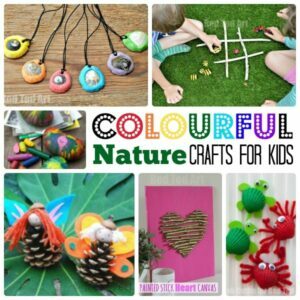 If you do bring some nature items home.. check out our colourful and easy nature crafts for kids! 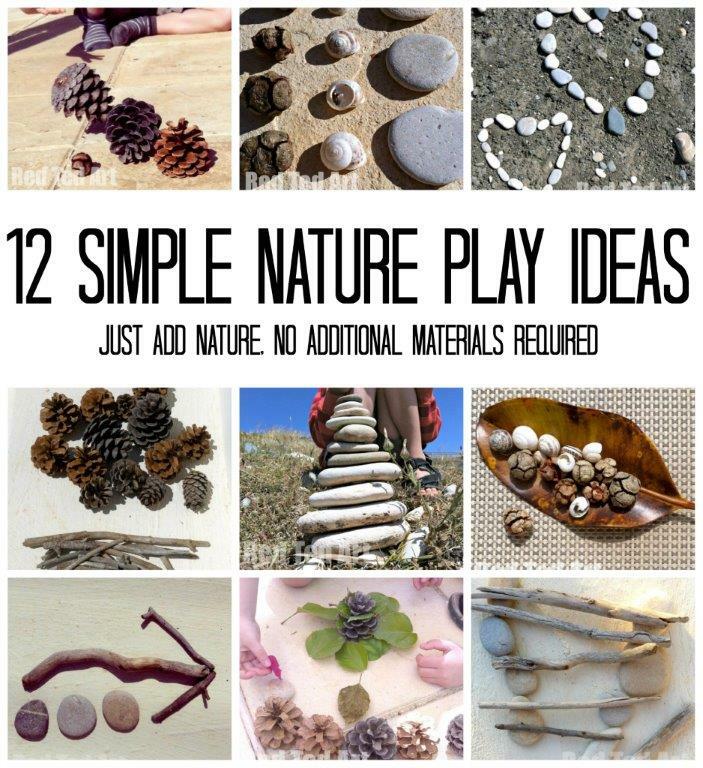 These Nature Play Ideas were first published in July 2014 and have been updated and republished for your convenience! 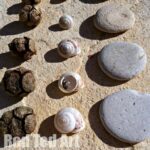 For the majority of our nature play ideas, I have photographs, but I have added a few more to complete the list! Where there are photos, please do click through for more info! 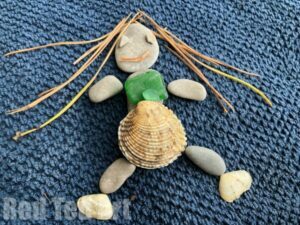 A recent addition to our Nature Play Ideas.. are these fabulous Loose Parts Nature Art ideas to create whilst out and about. Read our full post on Land Art and creating Pebble Art designs with kids! 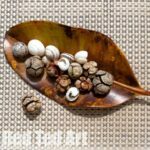 Place all your nature items in a container or under a scarf/ towel – get your child to feel each item and guess what it is – for older kids this will be “easy”, for younger ones it is a great sensory experience. You can discuss how it feels in terms of texture – prickly or smooth, but you can also talk about whether it feels warm or cold, light or heavy, big or small. Remember the game “Mikado”? 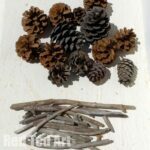 You have set of 30-40 wooden sticks ( a bit like Kebab sticks), with colourful lines on them. 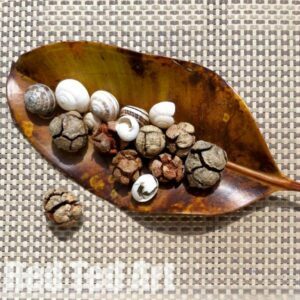 You let them fall onto a table and you have to slowly and carefully pull out a stick at a time to gain points. The trick is not to disturb the other sticks lying down. 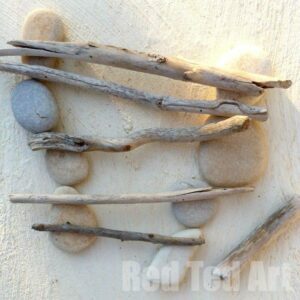 Play a “giant” Mikado version with a pile of sticks on the beach or at the park! If you want to turn this into a “craft” once home, you can always add some colourful stripes for different points once home. A great game for honing fine motor skills, as well as practice counting and addition. Glad you like them and my pleasure! What a fab list. My kids love construction play. They once spent 2 hours in a field trying to construct a “badger trap” using several large sticks, a folding chair and an old net. Lovely. 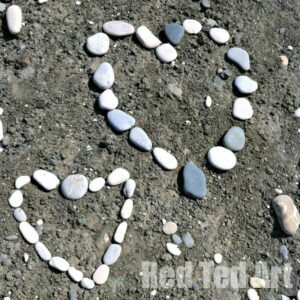 OOHH so many lovely ideas and they are all so simple, just making use of what is around you. I like the idea of a construction challenge and also making art. Thank you for linking up with our Summer Sandpit link up. Hi Red Ted Art, I love your posts ,really gets the creative juices going, I am becoming very addicted to looking at at your page and website. What lovely ideas!! 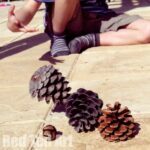 My 4 years old loves collecting shells and cones and then comes up with innovative games. Love this! We are huge on creative outside play. 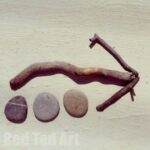 Nature is the best “toy” provider. Great ideas, just wished you have more ideas for the age of 12yr Olds. We need so time without fighting. But love the ones you have here. Those ideas are just adorable! I couldn’t believe why I have just found this. Hope to see more content from you in the future! Thanks for sharing this. Thank You for your sharing. I really like this post. I used to teach environmental education using activities like these. The kids thought it was all about play abd not having lessons – little did they realise how much they were learning!